These magnets are 2 1/4″ diameter. 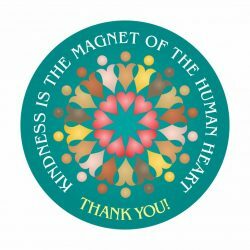 Kindness is the magnet of the human heart refrigerator magnets make an affordable thank-you gift to any individual or group whose actions demonstrate the virtue of kindness. It is also a wonderful reminder that kindness attracts the heart and draws people closer together. These magnets are 2 1/4″ diameter. They are also available as a button with the same Kindness message.